Polymer clay is a fun and affordable element with which to express your creativity, even if you are new to the medium. Pick up some colors on your next visit to the craft store to try your hand at creating jewelry to add to your wardrobe accessories, or give crochet hooks a facelift with colorful, handy grippers. 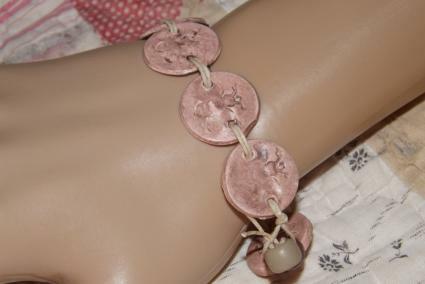 Enhance your wardrobe with this little bohemian bracelet made out of clay and hemp twine (pictured above). This would be a great activity for a craft night with the girls. Peach polymer clay, 1/2 oz. Place a small piece of wax paper on your work surface. Soften a 1" ball of polymer clay by kneading it in your hands. Place it in the center of your wax paper. Using a rolling pin, roll the clay flat until it is approximately 1/16" thick. Apply baby powder to the front of a charm. 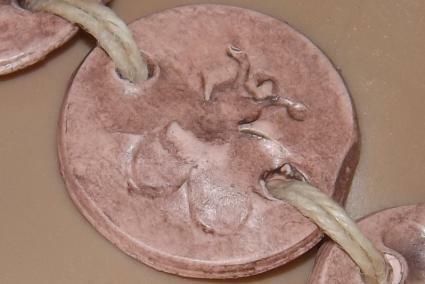 Place the charm face down on the clay and press with your finger. Lift the charm and repeat approximately 1/2" from the first impression. Repeat until you have a total of eight charm impressions. Sprinkle the inside edge of a spray bottle cap with baby powder. The powder will prevent the clay from sticking to the cap. 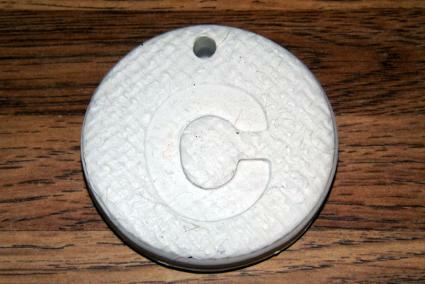 Center the cap over one charm impression and push down to cut out a disc. 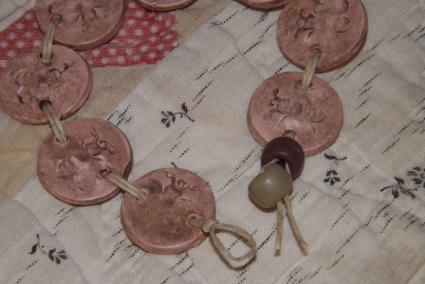 Repeat with the remaining charm impressions for a total of eight clay buttons. Using a toothpick, poke a hole on each side of the impressions on the side edge of the buttons. This creates holes to thread the buttons together. Note: The holes need to be as big as the middle thickness of the toothpick. 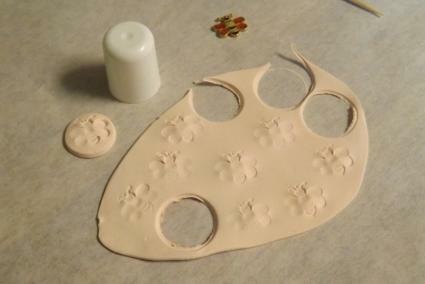 Line a baking pan with parchment paper and place the clay buttons on the paper. Bake according to the manufacturer's instructions for your brand of clay. Allow the buttons to cool. Apply brown acrylic paint to both sides of a button. Immediately wipe the paint off using a paper towel. Repeat on the remaining buttons. Apply Mod Podge to both sides of the buttons to seal. Cut a 24" length of hemp twine. Fold it in half. On the folded end, tie an overhand knot with a loop that is just big enough to slip a pony bead through. Twist the cut ends together. With one button facing you, insert the ends through the hole on the right, from the front to the back. Pull the double strand of twine through and slide the button down to the overhand knot on the folded end. Insert the ends through the remaining hole in the button, from the back to the front. Pull the twine through. Repeat with the remaining buttons, butting each button against the previous one. Thread the charms onto the bracelet. Thread one pony bead on the double strand of twine. Slide the bead against the last button. Separate the strands. Thread another pony bead on one strand. Bring the ends of the strands together. Tie a knot around the side of the bead. Trim the ends an inch above the knot. Wrap the bracelet around your wrist. Insert the last pony bead through the beginning loop to hold. Bold and chunky, this necklace has a retro-style texture and finish that pairs well with jeans, skirts or dresses. Monogram one for yourself and more for all of your friends. White polymer clay, 1 oz. Place a small piece of wax paper on your work surface. Soften a 1 1/2-inch chunk of white polymer clay by kneading it in your hands. Roll the clay into a ball and place it in the center of your wax paper. Using a rolling pin, roll the clay flat until it is 1/4" thick. Sprinkle the inside edge of a 2" biscuit cutter with baby powder to keep the clay from sticking to it. Cut one circle from the clay using the cutter. Lay a scrap of burlap over the clay pendant. Using slight pressure, roll over the burlap with the rolling pin. Remove the burlap to reveal the texture imprinted in the clay. Center a 1" foam letter stamp on the clay and press down firmly to embed the design. Poke a hole 1/4" from the edge of the clay circle using a wooden skewer. Apply texture to the clay. Line a baking pan with parchment paper and place the clay pendant on the paper. Use the manufacturer's instructions on your brand of clay to bake. Allow the pendant to cool. Use a scrap of denim fabric to lightly buff the pendant. This will remove any loose fibers that may have been transferred when texturing with the burlap. 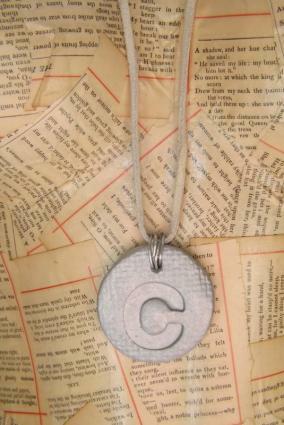 Paint both sides of the clay pendant using light gray acrylic paint. Allow the paint to dry. Paint the entire pendant with silver acrylic paint. Immediately blot off the silver paint using a paper towel. The silver paint will be removed from the raised areas, while settling into the crevices. Allow the paint to dry. Cut a 36" length of white suede lacing. This will allow the pendant to hang just below the bust. Adjust the length if a different drape is desired, ensuring that the length is long enough to fit over the head. Bring the ends of the lacing together and tie an overhand knot 1" from the end. Cut a 6" length of 18-gauge silver craft or jewelry wire using wire cutters. Hold the lacing loop by the knot. Place the opposite side of the loop on the edge of the pendant, above the hole. Insert the wire through the pendant hole. 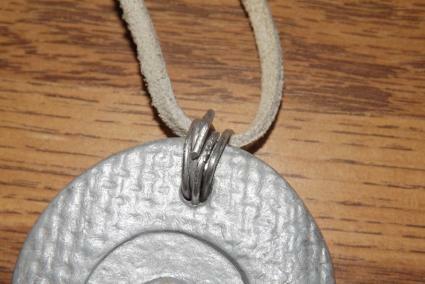 Wind the wire over the lacing and back through the hole in the pendant using needle-nose pliers. Repeat until the entire length of the wire has been wound through the hole and around the lacing. What do you give a crafter who has everything? Give her a set of custom crochet hooks. 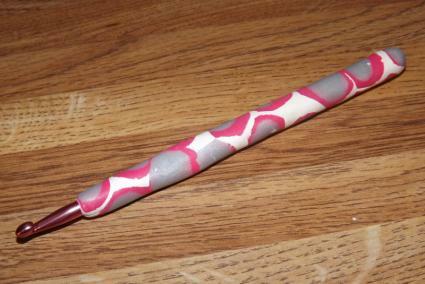 This simple hook grip is quick to make and uses up those bits of clay left over from previous projects. Choose scraps from three different colors of polymer clay. White, pink and silver were used in the example shown. Roll clay balls: Large (pea size), small (BB size) and medium (size in between the large and small size), one color per size. You will need at least 15 of each. Squeeze each ball flat between your fingers. Stack a large, medium and small flattened ball together. Squeeze the stack together. Place the stacks on a scrap of wax paper in two rows. Offset the rows and overlap the edges. Using a rolling pin, roll over the rows until the edges of the stacks create one solid sheet approximately 1/16" thick. Cut the sheet into a 1" wide by 5" long strip using a ruler and a knife. 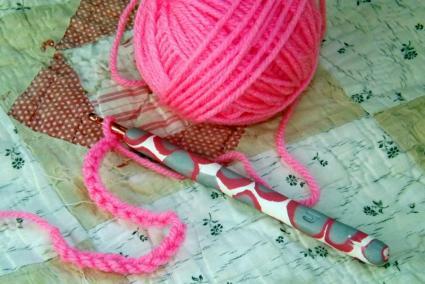 Lay an aluminum crochet hook on the clay strip. Extend the hook end 1" over one end of the strip. On one long edge of the strip, begin rolling the clay around the shaft. Roll tightly, and gently press the clay to the hook surface to adhere. Continue to roll until the shaft has been completely covered. Lightly overlap the long edges. Using a razor blade, cut off the excess where the edges meet. Press the seam closed and smooth using your fingers. Pinch the clay tube closed at the top of the shaft and round off the edge. 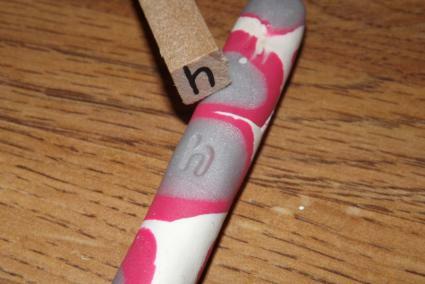 Stamp the size of the hook into the clay using a 1/4" letter stamp. Line a baking pan with parchment paper and place the hook on the paper. Bake the hook following the instructions for your brand of clay. Allow the hook to cool. Once you get the bug, you will discover a variety of projects and techniques that you will want to try with clay. Use these tips to ensure your projects are successful. Clay colors can be mixed to create new colors. Always use the same brands (such as Fimo) when mixing. While polymer clay is non-toxic, it is not edible. Tools and kitchen utensils should not be returned to normal kitchen duty after being used with polymer clay. Shop yard sales or thrift stores for tools that can be dedicated to clay work. If using a rolling pin that will be reused in your kitchen, wrap it with wax paper and tape the seam to prevent contamination. Old bracelets or earrings are a great source for charms to use for clay impressions. Polymer clay does not shrink, but to prevent drooping in the oven, clay pieces can be propped with folded card stock or small piles of cotton fabric. Expand your clay pattern library and perfect your skills with more quick patterns. Each of these projects can be achieved by a beginner. 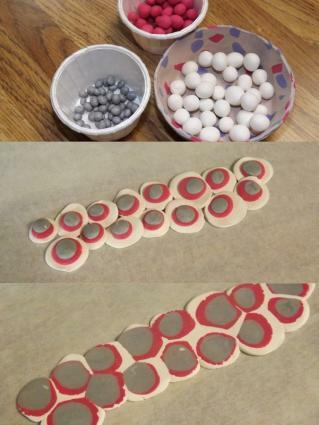 Polymer Clay Web has an interesting tutorial for making faux lava rocks. PCW uses table salt to create the unique texture of lava. Addicted 2 Decorating shares a beautiful dimensional art piece that looks like it was purchased from a high end boutique. Don't let that scare you though as the easy assembly of both the polymer clay flowers and the wooden base is simple to follow. Constant Crafter took her clay snowman supplies to her grandson's school and taught his class the basics of building a snowman. Use these instructions to create you own, with or without kids to help. Like crayons, glue and construction paper, clay is a wonderful tactile medium that can spark creativity in a child. Growing up doesn't mean that creative side has to go away. Put some polymer clay in your hand and let your inner Donatello shine through.